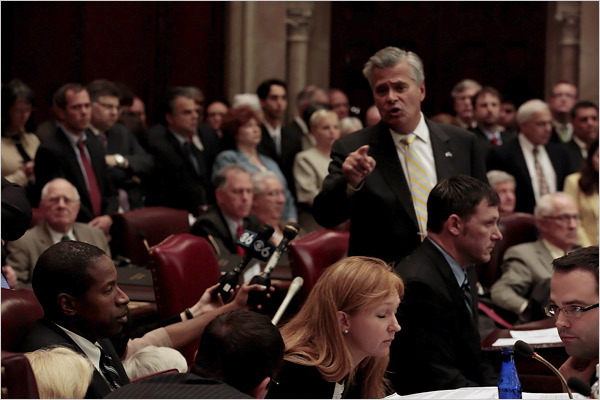 A pathetic example of how not to run a meeting is the NY Legislature in Albany. They are an organization in need of a serious re-organization. It’s a perfect example of meeting anarchy and what you want to avoid. I have sent them a copy of “Robert’s Rules of Order” in hopes someone there will read it and remember how to hold an organized meeting. I live in NJ, but my company is based in NY City and we pay way too much New York State and New York City taxes and it is depressing to watch them waste critical time, and my tax money. If I had the time I’d organize a march on Albany and fight to get them ALL fired, or start a campaign to keep them out of office the next time elections come up. No wonder the country and state is in such bad shape – our “leaders” in Albany can’t even hold a civil meeting. Maybe if they were forced to plan the meeting and use some effective PowerPoint slides like successful companies do, they would not be raising our taxes and cutting our services.